I have not really been working on Dawnstar since fall, but when I do work on the dev portions, I tend to make large strides in bursts. This is no different. 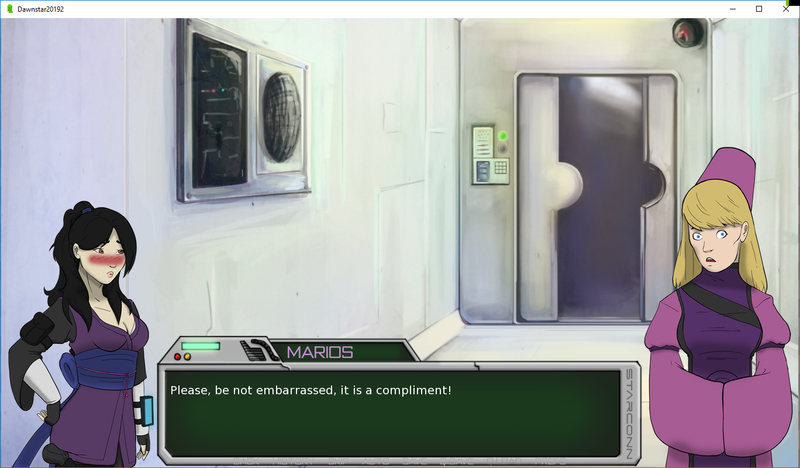 After much feedback from some of the Steam Greenlighters, I was able to use Ren’py’s new tools to make a custom chat box. In this instance, I went with a retro-looking “computron” frame for the box. Gave the name it’s own spot on the top, and everything can flow freely on the bottom, while leaving room for the characters! What do you guys think? Do you prefer this over the original black gradient? Let me know in the comments below. Dawnstar is hitting Steam Greenlight! Great thanks to Chelsea Cook for the trailer voice. Announcement following in a few days. This is a joke that I decided to visualize into a comic. 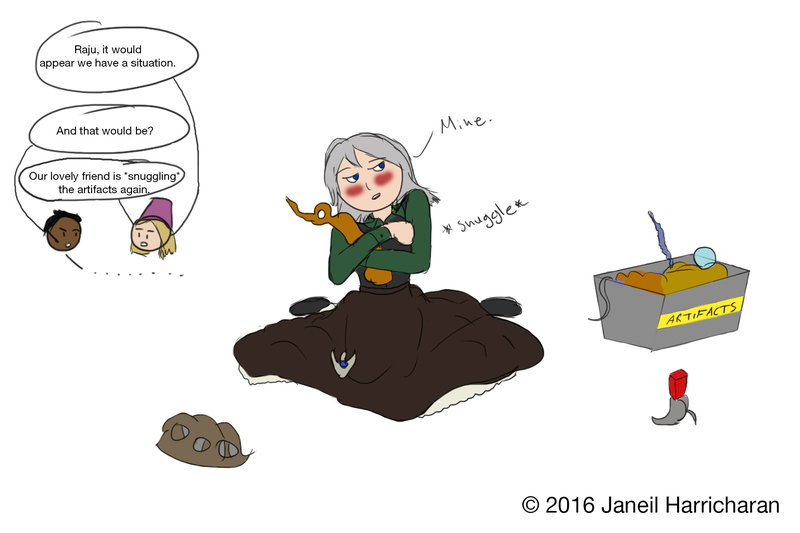 Back when recording lines for Dawnstar in 2011, Sophia’s voice actor Megan Swecker came up with the colloquialism of “snuggling the ruins”. While years have passed by, we jab the joke at each other occasionally and it still holds merit with the character, I would think. So consider this partially canon, that Sophia loves to hug up her ruins. Who knows? Best holiday wishes from the Dawnstar squad. Celebrating the holidays in their own style, which involves landing on a snowy planet and planting a Christmas tree for use. 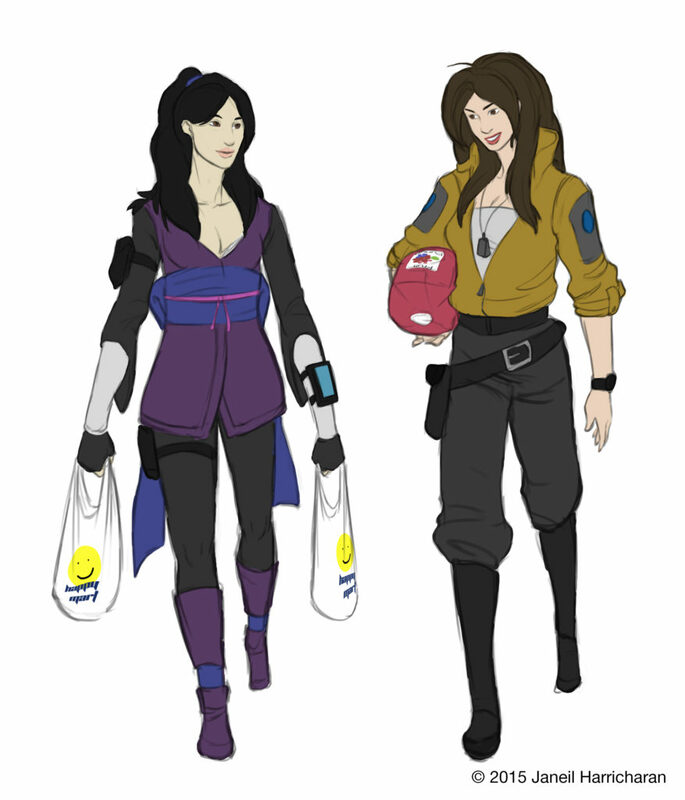 Christina helped me conceptualize this scene; the two more “Terran” girls of Dawnstar go grab necessities, as they know the layout and acceptable behavior when landing on Terran-owned colonies. Why Happy Mart? Sue me, they probably like convenience stores better than supermarkets. Who knows? I know it’s not much to look at, but this was a significant piece for me. I had gotten comfortable to walking into the ETSU DIGM labs on a whim to just use their PC’s for things, including the ones with the Cintiq 21UX tablets. This was the first drawing I did from start to finish, took me an hour one night when doing one of my classes that evening. I knew at that point that I HAD to get one of those new Cintiq tablets for myself. That gave me the best drawing experience that no tablet had before. So yes. 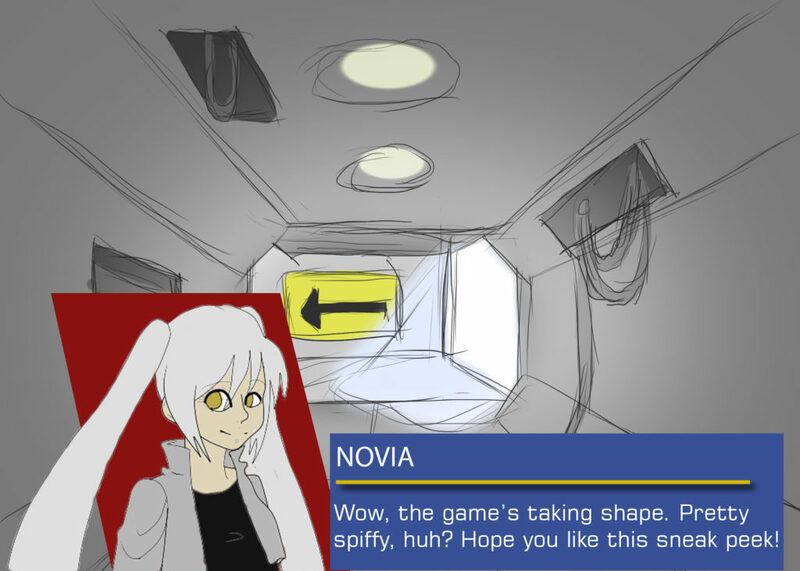 Novia gives you happy belated Valentine’s Day wishes. I drummed this up last night, thanks to IveeSparrow (NoraSR13) for producing two Dawnstar sprites for me! I think this is generally what I’m thinking for with the layout of the game. Definitely have a very long way to go with the art, but I hope I improve as I go through ETSU. Hey, big goals, right? I’m not exactly sure when I started to do this drawing, but I know I was in Color Theory class and we were watching a movie of Exit Through the Gift Shop, a documentary about the street art movement. I honestly was getting a little bored with it and my mind wandered to Dawnstar, realizing I hadn’t quite visualized my Yorina character. I decided to give her a stab and try to draw her out. 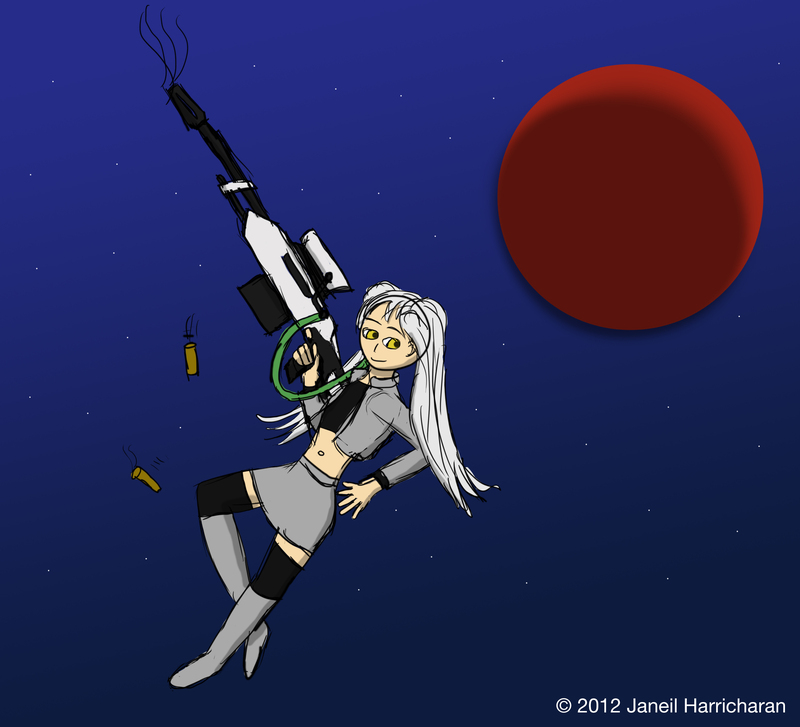 This was the final result, and had her all done to this point by the time the movie had ended. The biggest thing I was worried about was the face, and I actually did make it passable. I was happy with the entire result, and that snark that showed in her face became engrained into her personality as time went on. 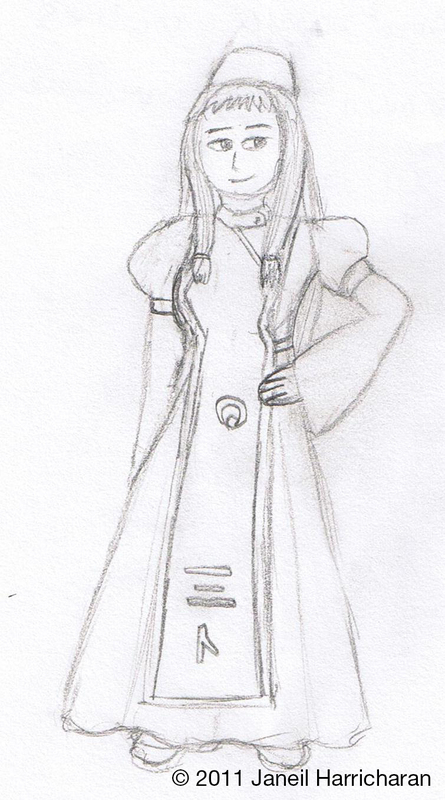 Out of all the other Dawnstar characters that I drew, she had come out the best, ironically. This is a project I cooked up while in my first DIGM class of the year at ETSU. It was a storytelling sequence in which we had to add sound effects and other things like voice acting, and tell a story in 3 minutes roughly. This was my project. It was a freelancer and a couple of his friends who are hired to return a ship Navigator along with a combat droid to a docked starship. Got criticized that this was more movie like but I guess I can’t win them all. Got a good grade, so that counts. Little did I know this would be one of the cornerstones for developing Dawnstar as time went on. My characters would morph into more original versions and veer off into something that I would be pleased with. It’s interesting to look back and see how far it’s come from simple sketches and this storyboard concept, even.